Health and safety legislation applies to all businesses, no matter what size or sector you are in. Its importance cannot be underestimated as failing to comply can lead to prosecutions with fines averaging £28,300*. As an employer, you are responsible for the managing health and safety in your business and you need to ensure you are providing a safe working environment for employees, contractors, visitors and anyone else who might be affected by your operations. All business need to be demonstrating an effective health and safety management system. 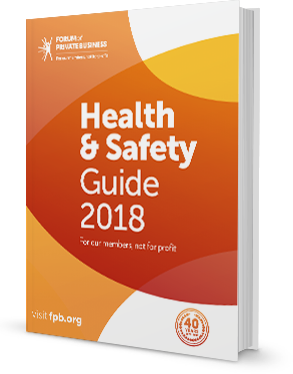 The Health and Safety Guide is a vital business resource to give you the peace of mind that you are fully up to speed when it comes to managing your legal health and safety duties. The simple guidance in checklist format will help you identify where you are already legally compliant and point to any action you need to take. The guide offers comprehensive up to date information on all the current legislation and gives you step by step guide to ensure that you can demonstrate your management arrangements for health and safety to the Health and Safety Executive (HSE), local authorities, clients, insurance companies, solicitors etc as well as providing a safe working environment. Covers topics relevant to all businesses such as risk assessment, manual handling, PPE and fire safety to sector-specific guidance, including offices, shops, construction, warehousing, garden centres and care homes. Easy to follow checklist format enables you to identify the areas where you do and don't comply or need to make improvements. More than 30 customisable templates including risk assessments inspection checklists and briefing forms help you take action towards compliance. Forum helpline access for your health and safety questions, plus the extra reassurance of our health and safety partner, who can provide additional support. To join the Forum online today select the number of employees within your business from the table below and follow the instructions.